You have an excellent product...If I could make one difference it would be t hat me and my kids are bigger than normal people. we are all over 6 ft and over 200 lbs...Having said t hat would like to see maybe 3X and bigger/taller items. I ordered a man's cutaway tails and pants suit and then a high collar shirt and tie within the last couple of weeks. They arrived promptly, were of excellent quality and correctly sized. I have ordered from you before and all of my transactions with your company have been pleasurable. I am a very satisfied customer abd will definitely be doing business with you again. Awesome! Will Definitely purchase more merchandise from here!!! We ordered this vest in olive and we liked it so much that we decided to also get it in brown. It fits perfectly. My fiance will be wearing the olive for our rehearsal dinner and the brown for our wedding day. He is going to look so good and feel really comfortable. The vests are so well made that I am surprised they don't cost more. Thank you so much, they are perfect! 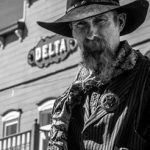 If I would have known the vest I bought was the same vest Wild West Mercantile had on sale I would have bought from them and saved $17. I thought your vest would be a better quality from the price. I just need to watch this in the future. Fred G.
I highly recommend Gentlemen's Emporium. My first online purchase was fast and easy. I received my item two days after I ordered it. It was exactly w hat I wanted and of first rate quality. I ordered a second item within a week of receiving my first order. It was a great experience. I will purchase from Gentlemen's Emporium again. You sell products that no one else seems to have for competitive prices. I have already ordered 4 more vests in other colors and I received them yesterday. I'm very happy with them. Awesome red top hat love it. Really well made top quality. Perfect fit .Excellent Service, Excellent Super fast shipping . I will refer you to all. Pic's coming soon thank you very much. Very professional , prompt, no problems and the outfit was absolutely over the top beautiful, the colour, the workmanship, and the quality of the velvet was awesome. so happy with this purchase and am looking forward to wearing it at our victorian Convention Themed Night. Saving money to order something else. I used the glasses on the 11th of April, for a Confederate memorial service. They finished my civilian suit. I am a chaplain for a Sons of Confederate Soldiers Camp 265, Rankin Rough and Ready, in Brandon, MS. I will be a return customer. The Trousers are very well-made. My only regret is that while I allowed an extra two inches for the high waist, I should have allowed three. I like my dress very much especially the fabric. It is for our 150th celebration. It will cover two years of celebration. I will probably order a hat thank you. I purchased a black western style holster. The leg strap and trigger loop was too small. Customer service responded very fast with how to fix trigger loop and sent and immediate leather strip to replace the one that was too short. Superior quality all around - fabric & construction. True to size. Shipped quickly & came w a pants hanger! Sometimes you really do get what you pay for; happily recommend to anyone. Took me forever to find 100% cotton bloomers which I'll wear under my sheer cotton maxi skirts this summer. Thak you, thank you, thank you!!! High quality products at a decent price and excellent delivery time. I have looked for sunglasses t hat I liked everywhere, stores and internet. Gentleman's emporium had exactly w hat I had searched for years. They are really cool. Love the quality of my dress. Would definitely buy from this site again. There was a time recently when I tried to find a bright good/yellow vest in your inventory but couldn't see anything quite the color I wanted (like the rating stars above). Even when I found some that were close to what I wanted, they didn't come in the size (XXL/XXLT) I unfortuantely require. Service personal was great very helpful. The first product I received was to large, but quality was good. When I received the product back in different size, quality was poor, not the same as first.